Welcome to yet another Top Ten Things, here at Enuffa.com where I blather on about ten what-have-yous and why I like them. Today we're back on the topic of movies! Specifically I'm talking about film trilogies. The trilogy is one of the most popular narrative forms for the film medium; there's a kind of magic to the sequence of Beginning, Middle and End, which I'm guessing stems from the traditional three-act play structure. Act 1 sets up the characters, settings and conflicts, Act 2 expands on them and usually puts the protagonists in some kind of danger, and Act 3 resolves everything and hopefully brings the story to a satisfying conclusion. Understandably the third part of a film trilogy is most often the toughest one to nail. How do you fully resolve a three-part story arc in a way that ties up all the loose ends and doesn't let down your audience? For the purposes of this article I've included a couple film series that are no longer trilogies, due to the powers involved opting to make an ill-advised fourth installment. But in both cases the franchises stood as trilogies for roughly twenty years, having sufficiently wrapped up the story. Thus I'm including them. One of the most beloved film franchises of the 80s, this time travel action-comedy trilogy is a childhood favorite of, well, just about everyone who grew up in those days. 1985 high school student Marty McFly unwittingly gets transported to 1955 when his eccentric friend, local middle-aged scientist Dr. Emmett Brown invents a time machine car, and after running into his future parents as teenagers, ends up endangering his own existence. Marty must act as matchmaker to ensure George and Lorraine fall in love, while also working with Dr. Brown's younger self to get back to 1985. With perfect casting and a brilliantly devised plot, this warmhearted sci-fi adventure was a box office sensation and remains one of the all-time great popcorn movies. But the story doesn't end there. 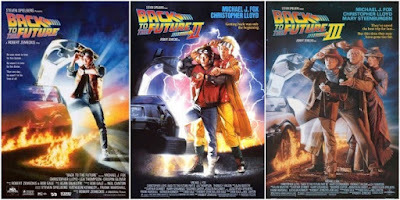 In the 1989 sequel Dr. Brown returns to 1985 after a jaunt into the early 21st century to enlist Marty's help in preventing his own children from catastrophic legal woes, and Marty accidentally alters the past when a sports almanac he purchases finds its way into Biff Tannen's hands and he steals the time machine. The rest of the film involves our heroes returning to 1955 to undo the timeline damage Biff has done, but the time machine is struck by lightning with Doc in it, transporting him to the old west. The second film is certainly very ambitious and fun to unravel, but falls short of its predecessor, with a few too many plot holes and joke retreads. The final installment on the other hand played it safe by being essentially a western-infused version of the first film. Marty travels back to 1885 upon learning that Doc Brown was murdered by an outlaw one week after arriving there, and the two must then devise a plan to get the time machine running so they can return to their rightful era. The greatness of this trilogy is mostly due to the first film, but both sequels are a ton of fun and help round out the story of an adventurous teenager and a wild-eyed scientist. Okay, so this trilogy is actually part of a larger film series, but the three films focusing on Steve Rogers are tied so closely together as a standalone arc, not to mention they unexpectedly served as the strongest part of the Marvel Cinematic Universe, that I had to put them on this list. If you had told me in 2011 that Marvel would've knocked it out of the park so completely with the Captain America character to the point that he's kinda the best part of The Avengers, I'd have knocked you down and pissed on your shoes. The first standalone Cap film, set in the 1940s, chronicles Steve Rogers' rise from a skinny, sickly Brooklyn kid to the very first super-soldier who singlehandedly prevented the sinister Hydra organization from destroying the world. The period setting and quaint, heroic tone reminded me a bit of the Indiana Jones films, and served as a very enjoyable introduction to the Captain America character. But it was the Russo Brothers-helmed sequel The Winter Soldier that really captured the imagination and made Rogers the most compelling Avenger. The James Bond-esque second film sees Rogers fending off a Hydra infiltration of SHIELD, involving three super-helicarriers capable of spying on the entire world, while also coming to grips with his best friend Bucky Barnes (thought dead in the first movie) having been brainwashed and turned into a ruthless assassin. This taut, spellbinding action thriller pushed the boundaries of violence in the MCU but also presented Rogers as an eminently relatable, straightlaced hero (the kind Superman SHOULD have been). To date this film is the apex of the Marvel series in my opinion. The third Cap film is no slouch either however. With the largest scope of any standalone Marvel film, Civil War deals with the aftermath of The Winter Soldier but also both Avengers films, where the US government has decided our superheroes need to be reined in to preserve public safety. A guilt-ridden Tony Stark agrees, but Steve Rogers balks at the idea, and this conflict builds to a massive battle between the fractured Avengers squad. Given that the MCU continued after Civil War, the larger story is not over, but this third film served as a thrilling, climactic conclusion to the series within a series. 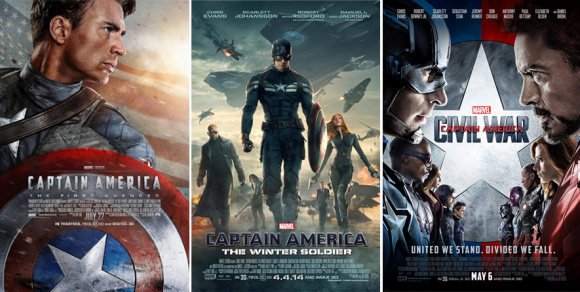 As of now there are no plans for a fourth Cap film, but the Captain America trilogy has to be considered one of Marvel's best film properties. 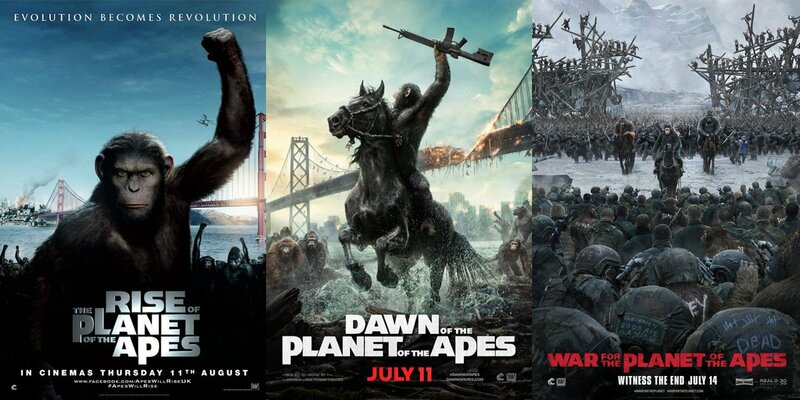 The Planet of the Apes prequel trilogy is astonishing to me for multiple reasons. First, when the series was announced I groaned, being fully convinced this was nothing but an artistically bankrupt money grab. But as it turned out, Rise of the Planet of the Apes and its two sequels were thoughtful, unusually quiet, character-driven pieces rife with social commentary, and not the bombastic CGI orgies I feared they would be. Second, the films restored my faith in CG as an effective means of telling a powerful story, via the revelatory central motion-capture performance of Andy Serkis as the series' protagonist Caesar. Serkis is a force of nature in this role, delivering nuance, pathos and sentiment previously unheard of in a computer-generated character. Either the Motion Picture Academy needs to start recognizing motion-capture as real acting or they need to introduce it as a new category. Third, this series bucked an almost universal trend of the third part of a trilogy being unequivocally the weakest entry. War for the Planet of the Apes is more profound, more emotive, and more engaging than either of its predecessors (no small feat considering what strong films Rise and Dawn are), and ended this cinematic trifecta on a startlingly high note. The POTA prequels were a wonderful surprise in an industry full of hi-tech predictability. For a closer look at all three films, click HERE, HERE and HERE. George Romero's trailblazing, subversive zombie series is no longer a three-film franchise, but from 1985 until 2005 it was known unofficially as the Trilogy of the Dead. Starting in 1968 with the guerrilla-made prototype zombie movie Night of the Living Dead, Romero used his gruesome, envelope-shredding horror as the backdrop for biting sociopolitical commentary, and each subsequent film followed suit, altering its message for the current era. The first film concerns a small band of survivors holed up in a farmhouse as the risen dead wreak havoc outside, but subtextually NOTLD deals with the subject of race relations and the civil rights movement. To this day the film stands as one of the scariest and most upsetting horror films of all time, and one that launched an entire subgenre. Its sprawling 1978 sequel moved the location to a shopping mall, changing the commentary to the topic of blind consumerism and America's obsession with material goods. Dawn of the Dead turned the volume way up on the gory violence but also moved the tone from outright horror to over-the-top action. 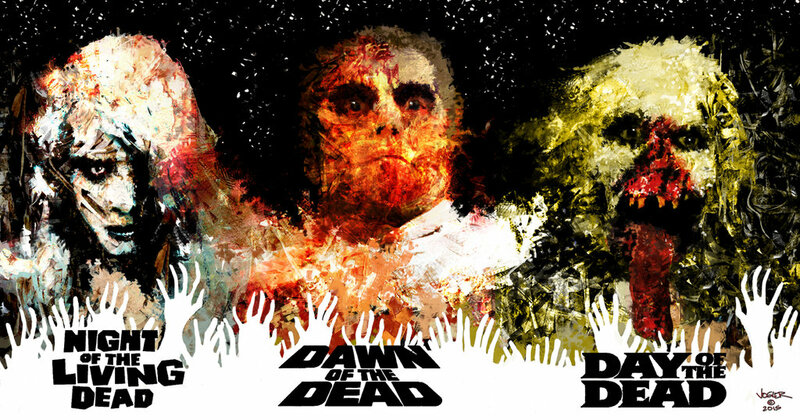 Dawn is widely considered the greatest zombie film ever made and remains George Romero's best-known work. The trilogy concluded on a pessimistic, dour note with 1985's Day of the Dead, set years later when the entire world has been overrun with zombies and only a few pockets of humanity remain in underground bunkers. One such party of survivors is on the verge of killing each other, as the military and scientific leaders find themselves constantly at odds. Day introduced the concept of zombies being trained to be docile, while also exploring the distrust of authority figures and military-civilian strife so prevalent in the mid-80s (not to mention it is a masterpiece of horrifyingly disgusting gore effects, courtesy of Tom Savini). Originally given a tepid commercial and critical reaction, Day of the Dead has since become a cult favorite and takes its rightful place as the finale of arguably the greatest horror film series of all time (The three 21st century follow-ups sadly failed to live up to the quality of the first three). For a deeper exploration of this trilogy, click HERE, HERE and HERE. Man, if the third installment of this trilogy were anywhere near the quality of the first two, this would easily be in the conversation for greatest trilogy of all time. The epic saga of mafia boss Michael Corleone took the world by storm upon the release of the first film. The Godfather gave us the most intimate look yet at the inner workings of a mob family, chronicling Michael's rise from veteran and promising student to the country's most powerful criminal overlord. It launched the career of Al Pacino, cemented Marlon Brando as an acting icon, and became one of the most revered gangster films in cinema history. For many fans though the sequel was an even greater accomplishment, following up Michael's rise to the top with a "heavy is the crown" story, wherein Michael is betrayed by allies and family alike and chooses to preserve his empire at the cost of his own soul and his loved ones. This fascinating thread is punctuated by flashbacks to Vito Corleone's younger years and his own journey from lonely immigrant to ruthless mafioso. The saga really should've ended here, as Michael's story arc was complete; he had pushed away or destroyed everyone he cared about, having been swallowed by his own power. But in 1990 Francis Ford Coppola, desperate for a box office hit, hastily threw together a third installment detailing Michael's old age and decline, as he becomes mixed up in a 1970s scandal with the Roman Catholic church. Aside from being unnecessary, the film is sunk by a cringeworthy performance by Coppola's daughter Sofia (a last-minute replacement for an ailing Winona Ryder), and the dawn of Pacino's veering into self-parody. We're left with a trilogy in which the first two films were transcendent, essential viewing and a third that didn't need to exist at all. On balance The Godfather trilogy has to be ranked fairly high. Another series I initially didn't think would have any legs is Pixar's golden goose. Toy Story was pretty earth-shattering in 1995; a movie created entirely with computer animation about the secret life of toys? Sign me up. Pixar imbued the lanky cowboy doll Woody and his chief rival the spaceman action figure Buzz Lightyear with such relatable human qualities you couldn't take your eyes off the screen. But then in 1999 they released a sequel and I thought, "Welp, this is gonna be a total retread." But it wasn't. Toy Story 2 expanded on the narrative by introducing us to Woody's backstory. He was from a popular 1950s children's show and he had a whole gang of friends. A greedy toy collector steals Woody from a yard sale so he can sell the entire Roundup Gang to a Japanese toy museum, and Woody's friends have to rescue him. This film was shockingly right up there with the original as a delightful family-friendly adventure film. "That worked out splendidly," I thought. And then eleven years later they released ANOTHER one. I said, "Alright, this is too much. What more can you do with a bunch of inanimate objects??" Well, goddammit, Toy Story 3 was in my estimation the best one yet. Woody's owner Andy is moving off to college and all the toys accidentally get earmarked for donation to a day care center ruled with an iron fist by a jaded, sinister stuffed bear named Lotso. Lotso puts them through humiliating initiation, consigning them to the youngest group of kids, who abuse the toys relentlessly. Woody, having been separated from the others, engineers a prison break. Besides having thrilling adventure elements, Toy Story 3 is the only film in which I've ever gotten choked up about the fate of a piece of plastic. Pixar, damn them, did it again, arguably even better than the first two times. A fourth installment was announced last year, and while my gut reaction was one of skepticism, this franchise has yet to make a misstep. One of the earliest trilogies in popular culture, J.R.R. Tolkien's epic three-part novel was adapted for the big screen at the turn of the millennium as a sprawling three-film saga by Peter Jackson. It made a killing at the box office and all three received multiple Oscar nominations, including Best Picture (which the third installment actually took home, becoming the first-ever fantasy film to do so). The Fellowship of the Ring, The Two Towers, and The Return of the King were each epic in scope at over three hours apiece, and they followed the journey of a hobbit called Frodo Baggins and his allies in their quest to destroy a powerful magic ring, lest it fall into the hands of its former owner Sauron. Why does such a simple premise require roughly eleven hours of screen time (if you watch the Director's Cut)? Well it's all about the characters, the settings, the textures, and the battles. Lord of the Rings introduced so many memorable heroes and villains (my favorite of which is the tormented, conflicted Gollum whose very soul had been held captive by the ring of power), and made use of cutting edge computer technology to bring this fantastical world to life. Along with the Harry Potter series this trilogy was a pop culture sensation upon its release and introduced a whole new generation of fans to Tolkien's richly detailed vision. Before Steven Spielberg and George Lucas took a giant dump on the world, known as Kingdom of the Crystal Skull, the Indiana Jones franchise had a 19-year run as one of the very best film trilogies known to man (or woman). Kicking off in 1981 with Raiders of the Lost Ark (my personal favorite pure action film ever made), we were introduced to the swashbuckling, world-traveling, Nazi-punching archaeologist sporting a beat-up fedora hat and wielding a bullwhip. Harrison Ford's action hero became THE role model for young boys, as we all put on hats, made whips out of rope, and pretended to search for treasure and kill bad guys. The inaugural Indy movie still holds up as a near-perfect action-adventure film, as Dr. Jones and his friends race to find the all-powerful Ark of the Covenant before the Nazis get a hold of it. 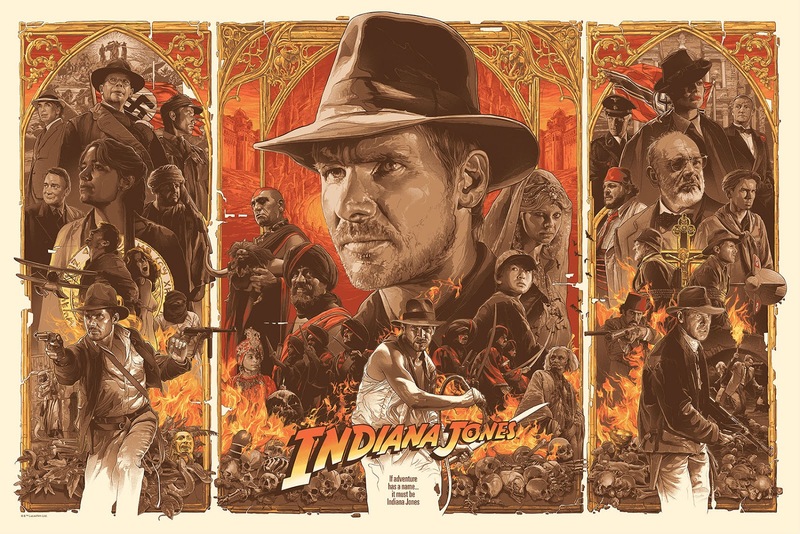 Lucas and Spielberg followed it up in 1984 with Indiana Jones and the Temple of Doom, which broke ground for being both the first official film "prequel" and thanks to multiple gruesome scenes (not least of which depicts a man's beating heart being ripped from his chest), for persuading the MPAA to introduce the PG-13 rating. Temple took the over-the-top action formula that had made Raiders so successful and added a much darker tone, echoing Lucas's previous film sequel The Empire Strikes Back. 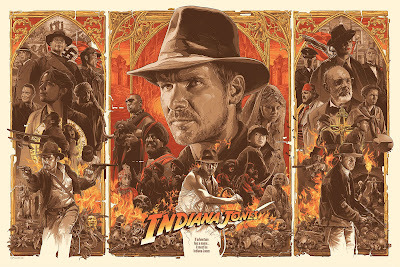 This time Indy had to retrieve a magical stone stolen from an Indian village by an evil, human sacrifice-obsessed cult. Temple proved nearly as much fun as Raiders while setting itself apart. Finally in 1989 the series and its protagonist returned to its Nazi-pummeling roots as Indy and his estranged father (played by Sean Connery) are charged with capturing the Holy Grail before the evil German forces can. At its core The Last Crusade is basically the same story as Raiders, but the addition of Dr. Jones Sr. adds some backstory to the Indy character and provides the film with much greater comedic fare. As a play-it-safe conclusion to the series, TLC is first-rate, and the Indy trilogy seemed to close on a perfect note, with our heroes literally riding off into the sunset. Then in 2008 the filmmakers ruined it with one of the most embarrassing sequels imaginable. Personally I like to pretend Crystal Skull never happened and remember the Indiana Jones saga as a near-perfect trilogy. I've gone back and forth the past few years over which of my top two picks is my favorite trilogy. It's a case of #1 and #1A for me. 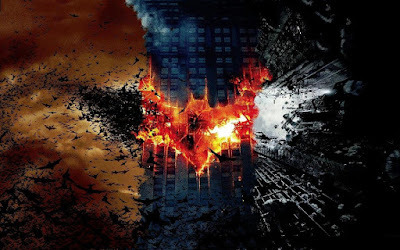 In this case 1A is the epic, genre-defying trilogy of Batman films by Christopher Nolan, which took the kind-of-absurd-when-you-think-about-it idea of a man dressing as a giant bat and beating up criminals, and grounded it in relatable real-world surroundings to create a crime drama series with comic book trappings. Starring Christian Bale as a note-perfect Bruce Wayne/Batman, the first film delved deeply into Wayne's character arc, giving us tangible justification for his bizarre nocturnal behavior. For the first time we got a true big screen origin story for Batman, and a gritty, realistic take on the mythos. Batman Begins was an auspicious start, but it was the 2008 follow-up The Dark Knight that really launched this franchise into the stratosphere. TDK expanded this Batman universe and introduced us to a bold, terrifying new take on Batman's archnemesis, The Joker. Played by the late Heath Ledger as a Mephistophelean anarchist, The Joker and Batman spend much of the film vying for the soul of Gotham City, in the form of idealistic DA Harvey Dent. Where Batman Begins was Bruce Wayne's character arc, TDK is Dent's; he begins the film as the city's new savior and ends it as a disillusioned, disfigured murderer. The Dark Knight set a new standard for superhero films and a decade later remains one of the most well-regarded examples of the genre. Nolan & co. had raised the bar impossibly high, and perhaps it was inevitable that the third installment wouldn't quite reach the same pinnacle. Nonetheless, The Dark Knight Rises is an excellent finale to the series, even broader in scope than its predecessor. This time Bruce is coaxed out of retirement and reclusion to save the city and perhaps the world from a masked terrorist known as Bane, who intends to fulfill the League of Shadows' plan from the first film to destroy Gotham City. Inspired by the Knightfall comic book arc, Wayne is injured and dumped in the prison Bane grew up in, and must find a way to escape before Gotham is nuked from the globe. This dark, thematic conclusion brings the series full-circle and completes a self-contained, contemplative Batman film saga that won't likely be equaled anytime soon. And now we've arrived at the holy grail of film trilogies, the original, unaltered Star Wars Trilogy (George Lucas's retroactive tinkering over the years has muddied this near-immaculate saga and I now avoid the Special Editions like the plague). Originally written as an expansive, 200-page script, Star Wars proved such an enormous, unfilmable undertaking that its creator George Lucas took the first third and made that into a film, reserving the rest for future installments. A New Hope, as it was later known, centered around a galactic good vs. evil conflict, inspired by classic morality tales, samurai films and Flash Gordon serials of the 1930s. A small band of heroes waged a rebellion against an evil empire, culminating with the destruction of their ultimate weapon. Star Wars became a pop culture phenomenon upon its release and revolutionized filmmaking, film licensing, and special effects, while launching numerous careers on both sides of the camera. Its sequel was an even greater critical success, fleshing out the story and characters, and introducing the greatest plot twist in movie history with four simple words: I am your father. The evil arch-villain Darth Vader revealing this terrible secret to our hero Luke Skywalker stands as the dramatic peak of the entire trilogy, while its surrounding film The Empire Strikes Back served as the blueprint for how to do a great film sequel. The trilogy's conclusion Return of the Jedi may have started the trend of flawed third installments, but it offered enough memorable moments, characters, and effects, not to mention a thrilling resolution to the Luke-Vader conflict, that it remains an essential piece of the overall story. The Star Wars Trilogy was for many the most beloved film series of all time, and its fingerprints can be found on nearly every movie trilogy since. Taking classic storytelling elements and enveloping them in crowdpleasing sci-fi/fantasy tropes, Star Wars would become a cinematic milestone that touched billions of lives. Thus it endures as the greatest film trilogy in history. 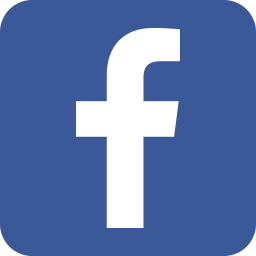 Thanks for reading - comment below with your thoughts, and join us on Facebook, Twitter and YouTube!.